For years, Al Qaeda and the Pakistani Taliban have nurtured a symbiotic relationship that has paid off for both militant groups. 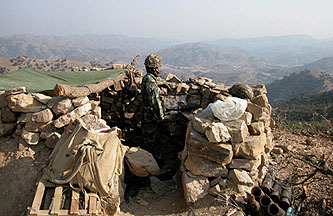 The Taliban provided Al Qaeda and its leaders sanctuary within the rugged wasteland of Pakistan’s tribal areas along the Afghan border. In turn, Al Qaeda trained and helped finance its host. Now, with the purported death of Taliban leader Baitullah Mahsud and his organization temporarily rudderless, Al Qaeda finds itself made vulnerable by the disarray plaguing its patron, experts and Pakistani intelligence sources say. It’s a window of opportunity that neither Pakistan nor the United States can afford to neglect. ….With the Taliban mired in disarray, experts say Pakistan and the U.S. need to ratchet up their bid to track down and eliminate other top Taliban commanders. The aim, they say, is not just to dismantle the Taliban, but to cut off Al Qaeda from the entity that keeps it insulated and secure deep within the badlands of Waziristan. Italics mine. Although the word “Afghanistan” is barely mentioned in this piece, it’s pretty obvious that amping up the pressure on the Afghan Taliban is the flip side of all this. So the question is: is it really true that the Pakistani Taliban is in disarray and al-Qaeda is vulnerable? Or is this all part of a finely tuned media campaign to build support for a troop buildup in Afghanistan? After all, we’ve been hearing that the Taliban is this close to defeat on pretty much an annual basis for the past five years. And who knows? Maybe it’s true this time. But even given the inherent difficulties in knowing what’s really going on in the border regions, I think I’d still like to see some more concrete evidence. As the article implies, one part of that would be evidence that the Pakistani army can actually fight effectively against the Taliban and al-Qaeda on its side of the border, something it really hasn’t been able (or perhaps willing) to do in the past. I’d like to see that happen first before we make any decisions about building up NATO and U.S. troop strengh.